The MCP9802 is a digital temperature sensor capable of reading temperatures from -55°C to +125°C. Temperature data is measured from an integrated temperature sensor and converted to digital word with a user selectable 9 to 12-bit Sigma Delta Analog to Digital Converter. 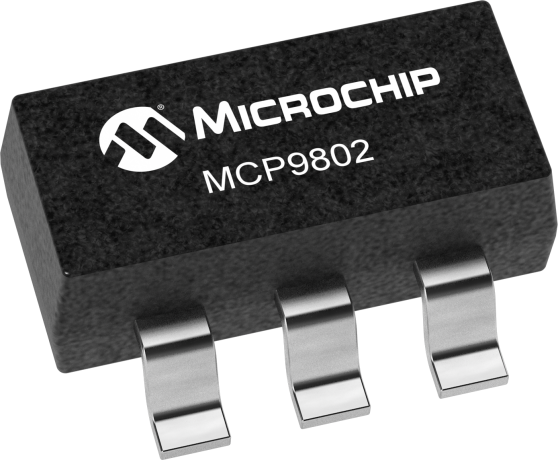 The MCP9802 notifies the host controller when the ambient temperature exceeds a user programmed set point. The ALERT output is programmable as either a simple comparator for thermostat operation or as a temperature event interrupt. Communication with the sensor is accomplished via a two-wire bus that is compatible with industry standard protocols. This permits reading the current temperature, programming the set point and hysteresis, and configuring the device. The MCP9802 also contains SMBus Timeout logic for improved system reliability. Small physical size, low installed cost, and ease of use make the MCP9802 an ideal choice for implementing sophisticated temperature system management schemes in a variety of applications.